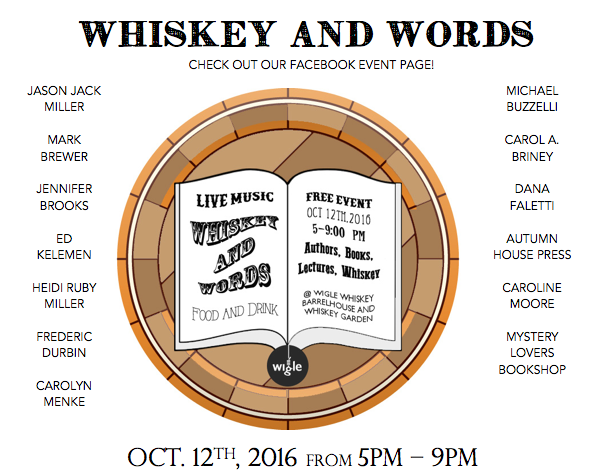 JASON JACK MILLER: You're Invited to a night of Whiskey and Words! You're Invited to a night of Whiskey and Words! We hope you can attend our upcoming event Whiskey and Words on Wednesday, October 12th from 5pm- 9pm at Wigle Whiskey's Barrelhouse and Whiskey Garden in Pittsburgh's Northside. In addition to our fabulous line-up of authors, we will also have delicious Whiskey cocktails, Burgh Bites Food Truck and the Mangini Trio. If you can't attend, but want to help support our local authors please share the flyer that has been attached.